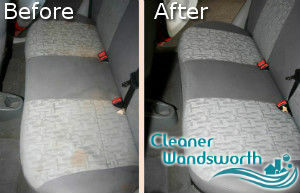 You can have the interior of your car ideally clean and fresh smelling provided that you entrust us and book a car upholstery cleaning. Our company is committed to delivering top quality cleaning services in Wandsworth and the neighbouring areas and we are happy to say that we have never disappointed a customer by providing poor performance. If you want to find out more about the car upholstery cleaning or any other service available in our portfolio, don’t hesitate to call us. We work seven days a week. Booking with us means that you can rely on professionalism, budget-friendly services and the best quality. No damages will be caused to the upholstery. It will be stain-free and pleasantly scented. Our cleaning experts know better than anyone else how to restore the great condition of a neglected piece of fabrics. They will use suitable detergents for stain treatment and the powerful steam cleaning machine will do the rest. 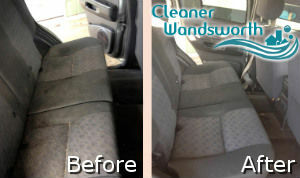 There is no need to waste time and efforts in trying the clean the car upholstery on your own when you can rely on our cleaners to give you a hand with the performance of that challenging task. They operate in Wandsworth, SW18 every day, you can arrange them even during the bank holidays. Get your free quote now, contact our call centre representatives at any time you wish.